Since their discovery in the late 1970s mesoporous silicas have attracted much attention due to their unique ordered pore structures, very high specific surface areas and range of morphologies that can be synthesised for examples spheres rods, discs and powders. 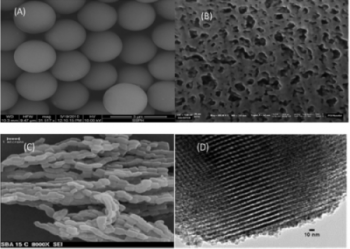 Unlike traditional porous silicas, mesoporous silicas exhibit unusually ordered pores due to the nanotemplating approach applied during synthesis. Over the past 30 years a plethora of mesoporous silicas (SBA 15, SBA 16 MCM 41, 48 etc.) have been synthesised with a wide ranging pore geometries (Hexagonal, Cubic etc.) and particle morphologies e.g Discs, Spheres, Rods etc. Figure 1 below illustrates some of the morphological qualities of mesoporous silica (MS) and porous silica spheres (PSS). PSS are spherical particles with quasi ordered porosity. Recent developments in manufacturing of mesoporous silica which allow production at a kg scale has allowed mesoporous silica to move from blue skies research laboratories into more advanced application driven research. templates for controlling the aspect ratio of quantum-confined nanoparticles and nanowires. Table 1 gives an overview of some of the application areas and thematic areas that these types of material may be utilised in. Nanoscale structures of semiconductor wires are expected to play a vital role as materials for both interconnects and emerging future technologies because of their unique optical, electrical, and mechanical properties. Mesoporous Silicas that contain unidirectional arrays of pores, typically 2-15 nm in diameter, running throughout a material have been successfully exploited as templates for semiconductor materials formed from the gas phase. Recently, it was reported the use of a novel supercritical fluid solution-phase approach to produce silicon nanowires within the pores of mesoporous silica. Figure 2 illustrates this work. TEM and XRD images of the MS before (TOP) and after (BOTTOM) shows the pore of MS filled with Silicon Nanowires. The high packing density of the silicon “mesowires” in the silica matrix makes them ideally suited for the formation of quantum structures. Metal ions are the most significant environmental pollutants found in wastewater and long-term exposure to solvated metals ions and their effects on human health and natural ecosystems is of major concern. The metals of primary interest include chromium, nickel, manganese, iron and various heavy metals because of a combination of toxicity and exposure levels. Methods for metal ion removal include precipitation, coagulation/ flocculation, ion exchange, reverse osmosis, complexation/ sequestration, electrochemical operation and biological treatment. Some limitations of these are for example high operating and energy costs. Sorbents such as activated charcoal, zeolites and clays have also been used as wastewater treatment systems. However, disadvantages of these materials include relatively low and variable loading capacities and small metal ion-binding constants. Ordered mesoporous silicas (MS) are becoming established sorptives that may be exploited owing to their large surface areas (typically 200–1000cm2 g−1) and large pore volumes and ease to which they can be recycled/regenerated. Functionalising MS with various chelating agents (or metal ion-specific ligands) allows specific metal ion pollutants to be selectively removed from aqueous or organic systems with correspondingly large uptakes. Table 2 shows the sorption capacities for the mono-functionalised (amine or thiol) and bi-functionalised (amine and thiol) SBA 15 MS.
Phosphorus (as phosphate ions) is an important element that is widely used in agriculture as a fertilizer and in industry as a detergent. However, the use of phosphorus poses many problems, notably eutrophication, when it is released into aquatic environments. Worldwide several Environmental Protection Agencies have identified eutrophication, resulting from excess phosphorus input, as the greatest threat to fresh water supply. Eutrophication leads to fish deaths and the degradation of habitat with loss of plant and animal species. Ordered mesoporous silica (MS) has proven to be a good adsorbent of materials such as metal ions and amino acids due to their high specific surface area, controlled pore diameters and controlled morphology, e.g. spheres, rods and disks. MS is mechanically robust, non-toxic and environmentally friendly. Much research has recently focused on using MS functionalized with selective ligands, for metal ion adsorption studies. 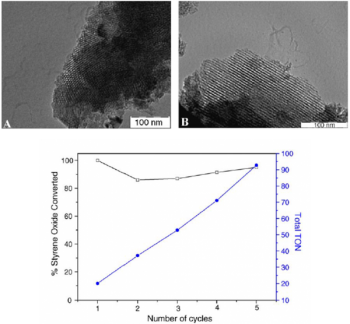 Mesoporous silicas doped with transition metals has been shown to be promising candidates for phosphate adsorption. 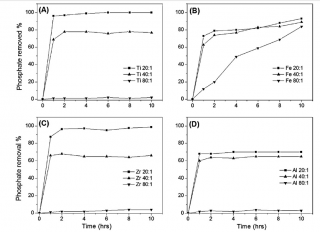 Figure 3 outlines several doped MS and their efficiencies at removal of phosphate from model aqueous solutions. In all cases the doped SBA 15 material exhibit high adsorption efficiencies. Figure 3: Phosphate removal from Waster water using Titanium, Iron, Zirconium and Aluminium doped SBA 15. In recent years indoor air pollution has become a major concern due to its well demonstrated effect on human health. The adverse health effects of indoor air pollution are expected to become more significant as lifestyles are predicted to become even more sedentary. In 2001, this was demonstrated in the national human activity pattern survey (NHAPS), where it was shown that US citizens typically spent 90% of their time indoors. Aldehydes in particular have adverse health effects (eye and lung irritation), and formaldehyde and acrolein are suspected carcinogens. Changes in building design and improved energy efficiency, along with maximising insulation and minimising air exchange, have led to increasingly airtight buildings. Modern synthetic building materials, such as sealants, plastics and solvent-based coatings, have further added to the problem of indoor air pollutants. Volatile organic compounds (VOCs), non-volatile organic compounds (NVOCs) and semi-volatile organic compounds (SVOCs) are of particular concern as indoor pollutants. Recent work has shown that Porous Silica Spheres (PSS) can be used to efficiently trap various indoor air pollutants, both in a simulated environment and in an indoor environment. The adsorbent was tested at relatively high concentrations (500 ppbV) and flow rates (10 L min_1). It was shown that PSS was found to be more efficient than the commercially available Amberlite XAD-4 resin at trapping non-polar VOCs and significantly more efficient at trapping polar VOCs present in ambient air. PSS adsorbent was shown to trap 100% of the gas phase carbonyl compounds present in a simulation chamber experiment in the first 10 min of sampling, while the XAD-4 resin was shown to have various levels of efficiency ranging from 100 to 8% over the sampling period for the same group of carbonyl compounds. The indoor at trapping polar carbonyls than XAD-4 resin in an indoor environment. Specifically, SSPH was shown to be significantly more efficient than the XAD-4 resin at trapping glyoxal, C5 and C6 unsaturated carbonyls. Highly ordered Zirconium and Titanium doped hexagonal MS with Si/Zr and Si/Ti ratios of 40:1 and 80:1 have been used as solid acid catalysts for the methanolysis of styrene oxide in a single-mode microwave reactor. The catalysts demonstrated excellent substrate conversion, high product selectivity’s and were shown to remain highly active for several reaction cycles. 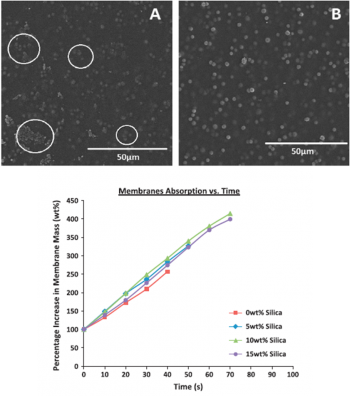 The experimental results clearly show that the zirconium doped mesoporous silica is an efficient catalyst for the liquid phase methanolysis of styrene oxide. The isolation of the products required a simple filtration/evaporation step. A typical reaction carried out with a 40:1 Si:Zr catalyst in a single-cavity microwave reactor operating at 105 W for 10 min afforded 100% conversion of styrene oxide. The products were 2-methoxy-2-phenylethanol (93%) and phenylacetaldehyde dimethyl acetal (7%). Recycling studies showed that the catalyst remained highly efficient for at least five cycles, with 95% conversion of styrene oxide on the fifth cycle after the catalyst was subjected to microwave irradiation while suspended in methanol. 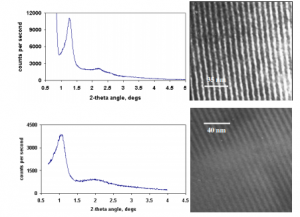 Figure 5: TEM micrographs of 40.1 Si ZR samples, hexagonal ordering (A) and pore retention (B) are shown. % styrene oxide converted versus Recyclability of 40:1 catalyst. It has been long established that increasing the effective surface area of a poorly water-soluble drug in contact with the dissolution medium can enhance drug dissolution. This can be achieved by loading drugs onto silica-based ordered MS which are characterised by high surface areas, large mesopore volumes, narrow mesopore size distributions (5–8 nm) and ordered unidirectional mesopore networks. These properties allow for homogeneous and reproducible drug-loading and release. The release of drug from the silica carrier is a key performance indicator to consider when employing OMMs for drug dissolution enhancement. The in vitro release of drug from drug–silica samples and the dissolution of the starting fenofibrate are shown (Fig. 6). Utilising MS as a carrier material improved the drug dissolution rate for all processed samples . Immobilisation of enzymes can confer a number of advantages including enhanced stability, ease of recovery and re-use and the capability of using the enzyme in solutions such as non aqueous solvents where the enzyme is insoluble. The main dis-advantages of immobilisation is that the activity of the enzyme is usually lowered and the process of immobilisation can add significant extra costs to the process. In addition, immobilisation methods tend to be non-specific and typically the process of immobilisation of a specific enzyme on a support is optimised and developed on a case-by-case approach. Ideally, support materials for the immobilisation of an enzyme should be mechanically and chemically stable, have high surface areas, be easily made at low cost and display low non-specific protein adsorption properties . Immobilisation should occur in a manner which does not compromise the conformation or activity of the enzyme, while diffusion of the substrate and product to and from the active site should not be hindered. MS has been widely used as supports for enzymes and in particular with the view of utilising them as supports for biocatalysis. 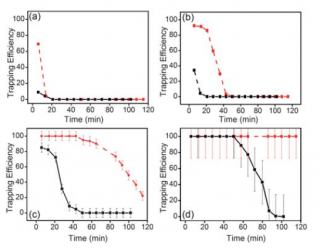 Figure 7: Activity profiles for cytochrome c immobilised on SBA-15 (Square) and PPS (Triangle) and for aqueous cytochrome c (Open CIrcle). The adsorption and activity of cytochrome c and lipase on twos silica supports (SBA-15 and PPS) with the same average pore diameter but with different pore volumes and surface areas has been examined. On SBA-15 loadings of cytochrome c and CALB of15.6 and 2.04 mol g−1were obtained in comparison to loadings of0.94 and 6.7 mol g−1on PPS, respectively. The differences in loading can be ascribed to differences in the properties of the supports (pore volume, surface area and morphology). The catalytic activity of cytochrome c was similar on both supports, while the activity of CALB was higher on SBA-15 in comparison to PPS (7.8 vs 4 s−1). These differences in activity for CALB likely arise from the pore morphology and the physical properties of the supports, a hypothesis that was supported by the higher recyclability obtained with SBA 15 as a support. The data indicates that the physical properties of mesoporous silica supports can significantly alter the activity and stability of enzymes. Food matrices are famous for being difficult to work with since they contain many unwanted or interfering compounds (i.e. phospholipids), and samples often require a clean-up step combined with extraction prior LC/MS determination. Recently doped MS (SBA 15 doped with Titanium) was used as a dispersive SPE (dSPE) QuEChERS based approach to sample preparation of liver tissues. Titanium doped MS has been utilised sample preparation of biological samples matrices prior to HPLC analysis The doped silica have been showed to have a preferential selectivity for the phospholipid content of certain samples matrices without removing the analyse of interest from the sample. The doped SBA 15 class sorbents are based on a novel Titanium doped high purity silica. Impregnating or doping the Titanium moiety into the silica framework offers significant advantages over other metal silica hybrid materials (where the metal moiety is attached to pure silica), and conventional silica in terms of robustness and chemical stability. Table 3: Recovery data for ovine liver tissue samples comparing C18 and SiTi(4%)-C18 sorbent materials. Pervaporation is a membrane separation technology primarily used to dehydrate and recover solvents and also to separate organic–organic mixtures. It has significant advantage over other separation techniques in that it can be used to effectively ‘break’ azeotropes of mixtures without any of the typically associated physical difficulties and negative environmental impacts of techniques such as azeotropic distillation. One method of improving membrane flux without significantly compromising selectivity is by inclusion of porous particles into the polymer matrix, e.g. zeolites and silica particles. In porous ceramic–polymer membrane hybrids of this type the engineering of the particles, i.e. size, shape, monodispersivity, pore size and surface chemistry, is of significant importance. Recent work has shown that the incorporation of engineered PSS into polymer pervaporation membranes can be highly beneficial. Results show that incorporation of spherical discreet, size-monodisperse mesoporous silica particles of 1.8–2μm in diameter and with pore diameters of 1.8 nm, when incorporated into a poly (vinyl alcohol) [PVA] polymer to produce composite pervaporation membranes, resulted in statistically significant increases in both flux and selectivity. Unlike zeolitic systems, PSS can be very controllably engineered to give a wide range of pore sizes and chemistries and may provide new generations of membranes for various pervaporation applications. Sequestration of CO2, either from gas mixtures or directly from air (direct air capture, DAC), could mitigate carbon emissions. The development of a new generation of porous materials iskey to enabling the “age of gas”, wherein new technologies develop around the use of gases. Carbon dioxide (CO2) represents a topical challenge in this context: anthropogenic emissions of CO2 are accepted as a significant risk to global climate; CO2 is an undesirable component of commodities such as natural gas and biogas. Recent work has shown that amine functionalised SBA 15out performed Metal Organic Framework (MOF) and Zeolite benchmark materials.